Graft, by Helen Heath (Victoria University Press, 2012) 79 pp., $28; A Man Runs Into A Woman, by Sarah Jane Barnett (Hue And Cry Press, 2012), 71 pp., $25. Heath also conceals her craft, her graft, in poems that often concern work, and women working. The beauty of science is a recurring subject – the work that lies behind the discoveries, and the human cost. The physicist and chemist, Marie Curie, features here; so do the astronomer, Beatrice Tinsley, and the biophysicist Rosalind Franklin, both of whom were under-recognized for their scientific contributions, and died young. Science and poetry have often been pitted against each other, with scientists, on the one hand, dismissing poetry as an entertainment at best, and poets, on the other, perceiving science and reason as inimical to the imagination. William Blake’s Newton crouches at the bottom of the sea, dividing and divining the world: reason, to Blake, is so reductive as to be a kind of madness. Heath’s poems show reason and the imagination as complementary, not antithetical; in the poem that begins this book, Newton the scientist cannot distinguish between ‘the moment of first light / or the last of the night’s magic.’ The poet and the scientist may pursue different kinds of enquiry, but they are united by a sense of wonder at the way things are. Among these science-oriented poems in the first section are poems cast as fairytales, and poems of a girl growing up — a young woman’s relationships with her father, her mother, and the loss of the latter. These have an insouciant, Plath-like sensibility, both playful and crystalline. The father is both idolized and found wanting (quoting Plath directly, one poem ends: ‘Daddy, you do not do’). The dead, absent mother — the trope of so many fairytales — relates also to the women scientists mentioned above, who struggled in their personal and professional lives in the context of pervasive sexism: Tinsley, for instance, eventually left her husband and children to take up a position at Yale. Her interlocutor seizes on the word ‘past’ and responds: ‘Archaeologist! You come to dig? !’ This speaker seeks to understand her past, yet struggles to be understood. But dig she does, discovering an old tunnel (‘I think you find Hades / says Georgio’) leading to a cave opening on to a beach, with the sun coming up – an illumination of sorts, if not the one she was looking for. The title represents a collision, and these poems explore what happens when different people collide: murderers and their victims; lovers; a transgender father and his/her daughter. These collisions are moments of connection, but also disjunction — ‘the space between people,’ as one poem has it – running into and running away. Running, literal and metaphorical, is a recurring theme. Collisions can also be transformations, blurrings, mergings, as colours run together. These poems tend to break down polarities, oppositions; even those spaces between people can be meeting spaces. The final, long poem, ‘Marathon Men’, blurs genres, slipping from poetry and the power of the line-break to prose and back again. 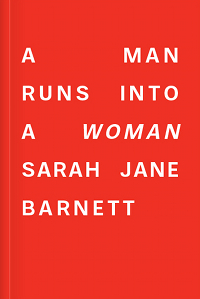 Barnett’s poems are difficult to categorize, to pin down, and her subjects are likewise elusive, on the move. Some poems capture life in a kind of freeze-frame, and the price paid for close observation is a kind of stasis. Barnett’s poems are different: they run alongside, into and away from their subjects, as if both observer and observed are in motion. I’ve never met her, but I’d bet money she’s a runner. Each of these debut collections demonstrates a singular vision, an assurance, and a technical facility that are deeply impressive. TIM UPPERTON teaches creative writing at Massey University, Palmerston North. His debut poetry collection, A House On Fire (Steele Roberts), was published in 2009. His poems have appeared in Best of the Best New Zealand Poems (Victoria University Press, 2011), Villanelles (Everyman, 2012), Landfall, Sport and the New Zealand Listener. He won the 2012 Caselberg Trust International Poetry Prize.